Ruby Red was practically snatched off my easel by a recent client. 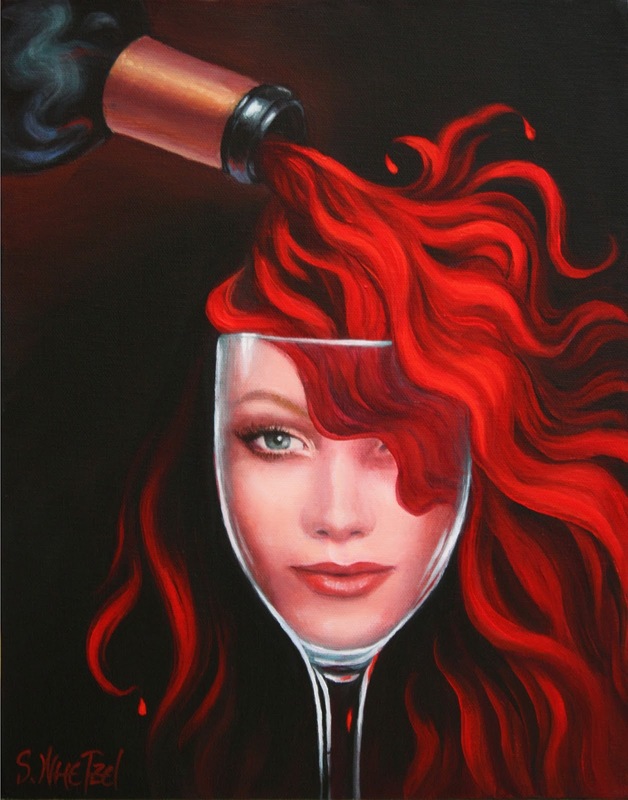 The popularity of this painting inspired me to create a sequel painting -- A blonde version with a white wine pour. For the white wine pouring over her head, I chose Chardonnay for its color and also, because I could have a bit of fun with a "word play" on that varietal. I will call the painting, "Chardonnae". Usually, a painting title doesn't come to mind until after I create a painting. I got a wine buzz! For my painting reference photo, I chose a three-quarter facial view of a blonde, instead of a full-frontal view. This choice differentiates the painting from its predecessor, but not without challenges. Portraits are the most difficult subject to paint. Add to that, the fast drying time of acrylics makes blending soft edges more difficult. Also, acrylics dry noticeably darker than when they were mixed wet. WHY DO I FREQUENTLY CHOOSE COMPLEX PORTRAIT PAINTING SUBJECTS IN MY WINE-THEMED PAINTINGS? I'm establishing myself as a contemporary "go to" wine artist who celebrates the wine experience differently than the ordinary wine art genre does. That involves creating wine art not typically seen. I haven't seen any women's faces or bodies in wine vessels the way that I render them. I hope to create sensual, elegant, simplicity in my wine narratives. Zooming in to intimate views of realistic or abstract human forms seems to engage viewers (and me) more. It's a challenge that fascinates me. After rendering her face similar to the reference photo, I realized she needed more dimension than was evident from the photo, especially on the left side. Without a subtle change in plane from the side to the front of her face, she literally appeared flat. The photographer used more than one light source to blow out most of the shadows cast by her features. Fashion photography intentionally avoids light that creates harsh shadows and lines to produce more flattering results. It was fine for the photo because her hand and her hair defined her well enough. Isolating her face from the rest of her head and including more of the side of her face with the three-quarter view, as I did in the goblet, created more of a portrait challenge. While I didn't want harsh shadows and features in my painting, I had to invent a more apparent light source and appropriate shading to define her facial forms. Considering my passion for wine art scenarios, it may surprise you to learn of my limited wine-tasting experience. I have never observed or tasted Chardonnay wine. (I do gravitate to white wines like Reisling and Pinot Gris.) For the painting wine pour, I googled "What color is Chardonnay?" I saw two kinds of Chardonnay pictured: One, pale yellow-green and one described as a golden copper-yellow, or saturated straw gold. I headed back to my easel with that descriptive vision of coppery-gold in my mind's eye. Things went well with the painting. For some darker areas to define the streams of wine pouring, I used a burnt orange. Unfortunately, the oranges became so rich that the coppery-gold tones were overpowered. When the painting dried darker, as acrylics do, I had a rusty-orange redhead; not the sultry blonde I was aiming for. This would not do -- I had to get it right. Painting is a constant process of adjusting. Sometimes you just have to get it wrong before you discover how to get it right. If you are local to Roseburg, I invite you to attend an artist reception for myself and two other artists, Susan Rudisill and Andrew Duclos at Fisher's Flowers & Fine Art, 638 W. Harrison St, Roseburg, OR on this Friday, 4/4/2014 from 5:30 - 7:30 p.m. Fisher's is near the corner of Harvard and Harrison. The art receptions at Fisher's are popular for their fine art, delicious treats and fine wine tasting. I have a few large, sensual wine paintings on display at Fisher's from now through June 27, 2014. I'd enjoy visiting with you in this relaxed, fun venue if you attend the reception this Friday. Sandi's vibrant, textured floras are hanging at Ticor Title Insurance and next door she has a few wine paintings on display at Fortress Financial, 180 Lithia Way, Ashland, OR through April 2014. These are new venues for Ashland's First Friday Artwalk, April 4th.